We at Purethanks see many benefits in giving. We are a company that values giving back to the environment and others. 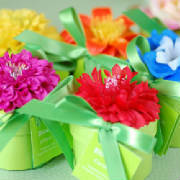 We are a company that uses eco-friendly products to produce plantable favours for all your special occasions. We have recently expanded our product line and are happy to introduce plantable invitations to our product line. By giving away one of our plantable favours or invitations you will be giving back to the environment and to a charity of your choice. Purethanks will donate five percent of each favour sold to the charity of your choice. Giving your guests a favour or stationary by Purethanks will be a memorable gift that will bring a smile to many people's faces.